Bright undergraduate students who are interested in marine science and oceanography are getting hooked into a program that may be the catch of the day – a new Research Experience for Undergraduates (REU) program at Texas A&M University that is attracting students from across the country. Funded by a National Science Foundation grant of $350,000, the three-year program will support 10 selected students each year from colleges across the United States. They will focus on a broad topic titled “Observing the Ocean: hypoxia, harmful algae, oil spills and ocean acidification” and each student has an individual research project geared to those areas, with a Texas A&M professor working closely alongside him or her to guide and counsel their research work. Professors from Texas A&M’s Geochemical and Environmental Research Group (GERG) and the Department of Oceanography co-sponsor the project, which had its first session this summer. Following a rigorous vetting procedure, the 10 students selected for summer 2016 were from Oberlin College, the University of Miami; the University of Tampa; the University of South Carolina; the University of New Haven; Houston Community College; Colorado College; Bethel College; the University of Texas and Texas A&M. The students developed a research plan, received training on sensors, data management and science writing, met weekly to present progress on their research, and presented a final seminar on their research at a Department of Oceanography Symposium. Each student’s research presentation was judged, and Veronica De Pascuale of Oberlin College, whose project was “Detecting chlorophyll degradation in open-ocean and coastal phytoplankton communities that are exposed to treatments of oil and oil dispersants,” placed first. She received a $1,500 travel award and will present her findings next year at a conference in Hawaii. 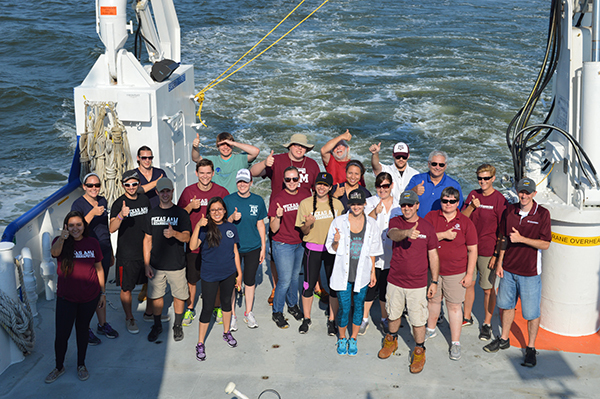 “The students worked hard and had a Texas A&M professor by their side serving as a mentor,” says Lisa Campbell, professor of oceanography who along with GERG’s Tony Knap, serves as co-director of the REU program. On the research vessel Pelican, students launched underwater gliders and collected water samples to measure dissolved oxygen, nutrients and salinity. Applications for next summer’s REU program will be accepted beginning Dec. 15 with a deadline of Feb. 15, 2017. About Research at Texas A&M University: As one of the world's leading research institutions, Texas A&M is in the vanguard in making significant contributions to the storehouse of knowledge, including that of science and technology. Research conducted at Texas A&M represented annual expenditures of more than $866.6 million in fiscal year 2015. Texas A&M ranked in the top 20 of the National Science Foundation’s Higher Education Research and Development survey (2014), based on expenditures of more than $854 million in fiscal year 2014. That research creates new knowledge that provides basic, fundamental and applied contributions resulting in many cases in economic benefits to the state, nation and world. To learn more, visit http://research.tamu.edu. Funded by a National Science Foundation grant of $350,000, the three-year program will support 10 selected students each year from colleges across the United States.